Is your website mobile-friendly? | Mountain Stream Group, Inc.
You are here: Home / Blog / Services / Marketing Communications / Is your website mobile-friendly? Because 25% of all search queries are now on mobile devices, according to BIA/Kelsey, eMarketer estimates — in 2014 — 129.9 million US consumers used a mobile phone to search the internet at least once per month, and Google states 9 out of 10 mobile search users have ‘taken action’ as a result of a mobile search, with over half leading to a purchase. Source: comScore / Neustar Localeze, “Trends Shaping Local Search in 2014”, April 2014. Depending on the study, somewhere between 63% and 70% of people who conduct mobile searches take action within an hour, and 84% take action within 5 hours. A 2012 MobiForge study says 90% of mobile searches lead to action and more than half lead to purchase. By comparison, 70% of online searches lead to action within one month. Google states 70% of respondents said they had used the “call button” in Google search results. BIA/Kelsey says the number of calls to business driven by mobile search is growing at 42% per year and is predicted to fuel a staggering 65 billion calls in 2016 — and more than 70 billion calls to businesses by 2018 according to Google. Speaking of mobile searches and action, Google states 50% of consumers who conducted a local search on their smartphone visited a store within a day and 18% of local searches on smartphone lead to a purchase within a day. And, according to a comScore / Neustar Localeze study nearly 80% of mobile phone searches end in a purchase. eMarketer estimates that there were 145.9 million mobile shoppers in the U.S. this year, up 23 million from 2013, and that by 2018 smartphones will account for 26.1% of all m-commerce. A UPS/comScore “Pulse of the Shopper” study found 41% of smartphone owners have made a purchase using it and 51% of tablet owners have made a purchase using it. Having a mobile-friendly website isn’t only essential for B2C companies. It’s critical for B2B companies as well. Smartphones are a critical business tool with 92% B2B senior executives owning one and 77% using their phone to research a product or service for their business, according to the IDG Global Mobile Survey 2014. B2B decision-makers are using their smartphone (69%) and tablets (71%) during work hours to research products — and 53% say a bad mobile experience makes them less likely to buy from a brand. A CNBC survey found that 78% of B2B executives worldwide use their personal smartphones for work and 75% their personal tablet for work. A Google/Millward Brown study finds 49% of B2B researchers use their their mobile devices for product research — comparing prices, reading about products, comparing feature sets, and contacting distributors — at work. 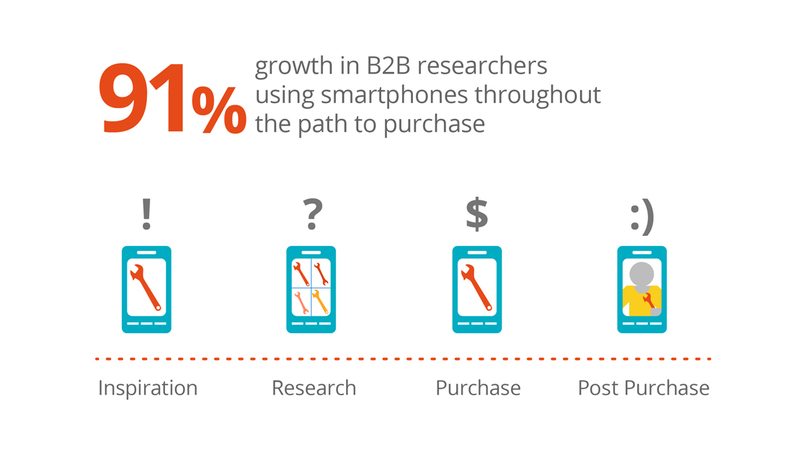 The Google study also found 42% of researchers use their mobile device during B2B buying cycle, and they’ve seen a 3x increase in B2B mobile queries. More importantly, B2B purchases on a mobile device have grown 22% since 2012 when the Google/Millward Brown study was conducted. Source: “The Changing Face of B2B Marketing”, Google/MillwardBrown, March 2015. Eccolo Media reports 25% of B2B decision-makers said they would consume more content on their mobile devices if it was mobile optimized. Speaking of consumption, eMarketer estimates mobile accounts for 23% (2:51 hr:min) of all digital media (B2B and B2C) being consumed versus 18% (2:12 hr:min) for desktop/laptop. So, it’s time to update your websites to make them mobile-friendly, if they aren’t already. Call us today at 847 453 8895 for a FREE mobile-friendly test. Our designers, engineers and programmers can help you build a mobile-friendly website.